This book has been on my "to read" list for years and I finally got around to it this past week. This is just a fun and ridiculous story. 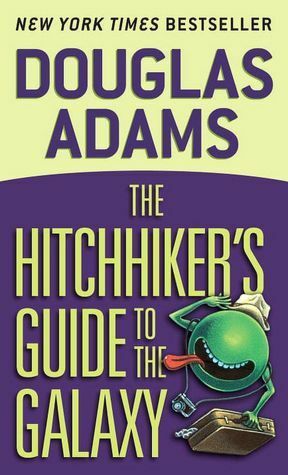 The Hitchhiker's Guide to the Galaxy is the story of Arthur Dent, an average Englishman who is swept off on a crazy adventure. Arthur awakens one day to bulldozers surrounding his house - the town council has planned a new bypass to be built over the spot his house is built on. The councilman claims that the plans were displayed for 9 months in the council building (in the cellar with no stairs and no lights, behind a door that said "Beware the Leopard"), and there is nothing Arthur can do to contest it now. In the midst of Arthur laying on the ground in front of the bulldozer in protest, his odd friend, Ford Prefect, appears and tells Arthur that he must come to the pub with him immediately. Arthur is eventually convinced and he leaves with Ford to have some forced drinks with him. Ford proceeds to tell him that he is not, in fact, from Earth, but from a planet somewhere in the vicinity of Beetlejuice. He then tells Arthur that he must drink because the Earth is scheduled to be demolished in a few minutes. The story only gets sillier from there. I'm sure many people have seen the film by now and know that the dolphins knew about the demolition of the Earth and have the message, "So long, and thanks for all the fish," to leave with the earthlings. Arthur and Ford end up all over the galaxy on a stolen ship with an improbability drive. Much hilarity ensues. I have to say I really enjoyed this book and it definitely lives up to its reputation of being on most every list of "Book you should read in your lifetime" I've ever come across. It's a quick read and certainly never boring. I spent most of the time amazed at how creative Douglas Adams is - seriously, what an imagination. Also the book is written incredibly well. There were many times that I laughed aloud to myself. Even if you're not a science fiction buff, this is worth a read because it is funny to just about anyone. I give this book 4 out of 5 stars.